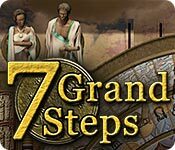 Guide the generations of one family through ancient times in 7 Grand Steps! An enormous tableau of the rise of western culture awaits your exploration, but the game starts with simple, absorbing play that expresses a common facet of life, two steps forward one step back. Then, like layers upon a pearl, game play expands, allowing fresh tactics and strategies which, turn by turn, drive a sophisticated, emergent narrative. How you play defines the lives of one family's generations through the changing ages. 7 Grand Steps is rated 3.8 out of 5 by 18. Rated 5 out of 5 by DiamonDancerSD from INNOVATIVE FORMAT AND CEREBRALLY CHALLENGING GAME OF LIFE, DEATH, and FATE! 7 Grand Steps is a challenging game of strategic management. Final Destination meets the game Risk meets the game Life! 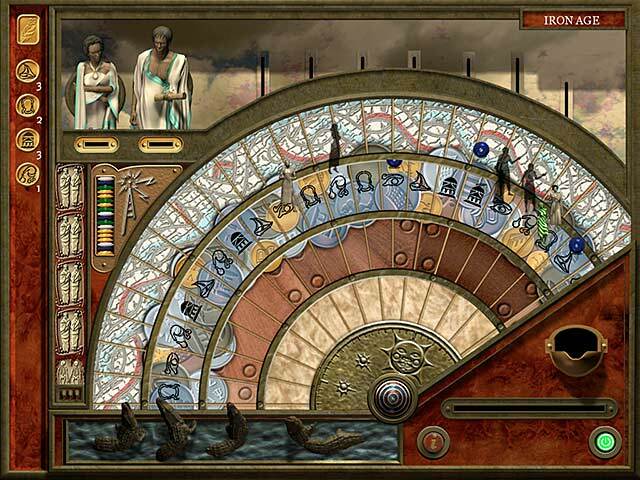 You choose your Dynasty's destiny as you navigate the perils of famine, war, political and social entanglements, and the acquisition of wealth. Your choices will either lead your family to innovative discoveries, heroic acclaim, and rising social status or cause your family's demise in poverty, intrigue, or war. Only careful management will allow your family to thrive generation after generation. But beware of the fickleness of Fate! 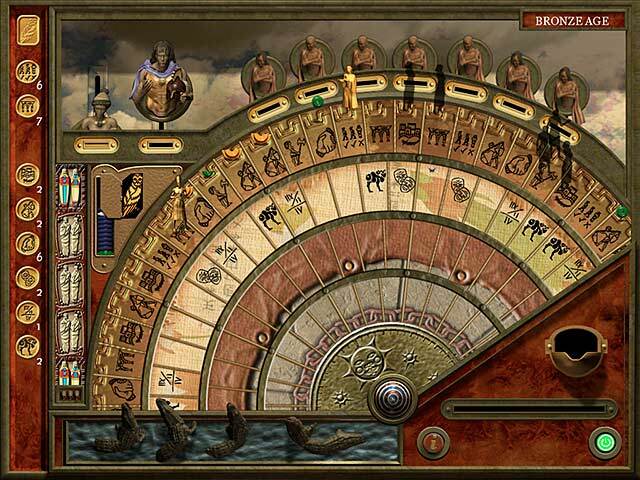 Played on a unique board that revolves toward a pit of hungry crocodiles to simulate the passing of time, your characters must successfully interact with helpful allies, envious enemies, acquiring tokens of skill and knowledge and spend those tokens to socially advance your family and successfully raise the next generation. Collecting your currency of skills, social status, and acclaim requires careful social strategy and wise decisions to situations posed by the Owl of Fate. Be sure to pay attention to clues given about your characters' personality otherwise, Fate and her consequences can be very cruel. Additionally, if managing the fate of your immediate family is not challenging enough, you can choose to simultaneously manage the finances of your city, the size and health of the army, the conditions of your defenses, and choice of war and peace in the kingdom as well. Your decisions on a global scale will then ultimately affect your family's fate. However, you can play the game through to the end without this added dimension. 7 Grand Steps gives you many options and you choose the complexity of play. Whether you choose to manage your world globally or just the fate of your immediate family, successfully raise descendants before the trials of ancient life or old age end the current generation in order to continue to the next Grand Step! I can play this game over and over! But I DO hope the sequel will eventually be released!!! Rated 5 out of 5 by GalaxyJim from Different than any other game I've played If you like interesting story-lines, this one has that in spades. Follow your family tree through each successive generation of struggle, heartbreak (one of my characters got abruptly killed in a war), and ultimately, success - that's measured not only by an individual's accomplishments, but also by how well the next generation is trained and ready to take their place. I really haven't seen anything else like this. I've played it for an entire afternoon now, and still only gotten to the second 'Age' - but I'm hooked now - I really love the design. Something this different won't be for everyone - but if you're interested in something different from the normal strategy games, with an excellent storyline, this one's probably for you! Rated 5 out of 5 by Kikime from subtly addictive roleplaying/board game Game story is based on ancient world history. Before you play, you need to read through the instructions by pressing the info button and choosing from various golden owl icons. This way you understand what strategies to use. After you press play, you are given your first two characters, a prehistoric couple in love. Both the man and the woman are moveable pawns on the board, so it could actually work as a cooperative game for some creative couples, emphasis on cooperative and some. 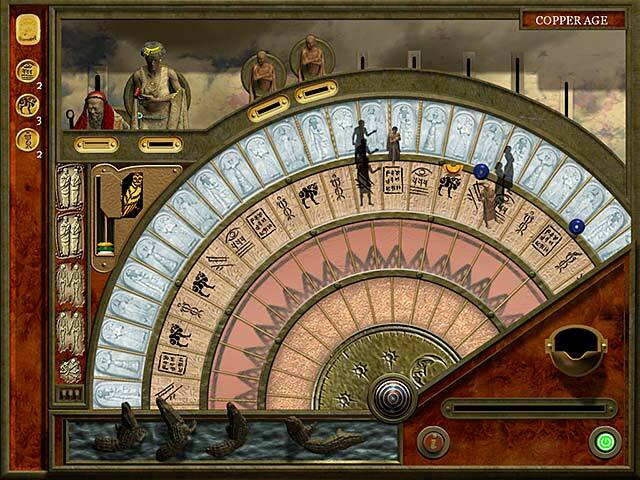 One quarter of an incomplete wheel is shown at a time, the board, it rotates toward snapping crocodiles, one place, before the start of every turn. Pawns too close (for themselves) will refuse to move backwards and not make tokens. Pawns make tokens by moving toward the river to the game character closest behind them or work with anyone on the same square if no one is closer to the river than them. . Crocodiles represent fear of mediocrity and failure, besides representing death of old age. Without talent tokens you cannot move forward. Moving forward to the right place brings you into contact with beads which are collected and traded for one of three kinds of sudden windfall of success for your dynastic history. A man or woman who lands on the square of a spouse who loves them (or an ally) will advance to not only the next space that matches the token spent but the space that matches after it also, and can collect beads from both squares. It is well worth it to marry someone you love or someone who loves you. Children can be tried for when you move up to a spouses square and can happen accidentally when you attempt to make tokens (moving backwards into their square). Heirs must be educated to make tokens well when their time comes.Too many children will diffuse the heirs inheritance of tokens, everything you die with is handed over square or divided amongst all educated children. They also cost more to educate, for which you must feed them one token per grade point desired in any given field, one only per turn, per child you want educated. Children will make tokens to make up for this, the higher their grade the likelier they succeed and they give the same token type they have the highest grade in most often. The only problem with this is the potential for sibling rivalry that can cause financial disruption when the heir is grown, thievery and doctors bills. Siblings can be helpful when they are treated exactly the same each turn as the heir. This is too expensive to do with a large family. Besides the board game, choices will come up and stories about the pawn or the children. People in the highest caste will have government decisions to make, as well. I played this game after installing it, from 1o pm to 83o am without noticing the time go past. The only thing I don't like is that the game ends (temporarily) at the age of migration and you need to go to the makers website for part two which works with your saved game. No, I also didn't like the jump from one age to the next which leaves out a hundred or so generations and starts up again with a game chosen, unknown descendant. Three, I would have liked to name the children. I did really like the snapping crocodiles and other imagery. The babymaking pictures seem really provocative to me. Maybe, that's just me. I also notice the woman sometimes looks like mother goose would with a bigger beak when your eyes start to go. That's something she's doing with her arm, if you run into it, too. Not all of the women do this. Rated 5 out of 5 by AthenasDaughter from Unique and Thoughtful I really enjoyed the freshness of this game. It takes a minute or two to pick up the rules, but it's not frustrating, and once I figured everything out, I was immersed. One of the few games I played all the way through the free trial and wanted to continue playing! It doesn't have fancy graphics and bells and whistles, and I wish there were more games like this - just purely based on reaching a goal by thinking things through and strategizing. There is no "random clicking" or "hunting" in this game. It is truly just that: a GAME. Rated 5 out of 5 by Lyndy20 from Unique and challenging This is quite a unique game and it really is nice to see something different. It's a turn-based strategy game, played entirely on a board. The objective is to create a family history that continues through the ages, building knowledge, making life choices. Your main characters, ( husband and wife) move around the board and the static children are educated based on the tokens you give them. Most moves are forward, but there is a backward move that is sometimes necessary to make, e.g. to get more tokens. This can potentially be dangerous because, with each turn, the board rotates backwards towards a danger zone. There is only one action per character in each turn and sometimes limited tokens. Also, other people appear on the board. You have no control over them and they can help or hinder the progress of your characters. Therefore, the choices you make need to be thought out. Your characters will age and one of the children will need to be selected to continue the family. He/she undergoes a rite of passage, the outcome of which is based on the education received. There is no winning or losing, just choices to make that define his/her personality. He/she then becomes your new main character and prospective husbands/wives are placed on the board. The most suitable partners have a heart icon, but can you reach them or will you need to settle for second best? Will a marriage without love bear children, I wonder? Other excellent reviews have explained things a lot better than I can and I have learnt a thing or two more from them! This game is intriguing, with more depth to it than I initially realised. A definite purchase. Rated 4 out of 5 by Jemby from Extraordinary Captivating Game Very different from all the other BF games I've played - almost hypnotic in its fascination. There are many threads of storyline, each determined by the choices you make. Lots of strategy required to acquire tokens and complete goals - which either reward you with tokens or raise your skill level or social status. To succeed you must marry early, have children, and educate them using the tokens you earn. But leave plenty of tokens at the end of your time for their dowry in the next generation. Thought-provoking, puzzle-solving game; and though it is essentially the same play throughout, there is great variety in the direction of the story as new challenges come up, and new twists to the story occur. Once you reach ruling status, you have to vote in the Senate, making decisions that affect the worker class, the elite, and the military. I find this fascinating and a real departure from the usual PC games. Highly recommended! Rated 4 out of 5 by ee1958 from Give this game a chance 7 Grand Steps starts slow. That's how it should start, though, as you are playing the character of a field worker in a semi-primitive society, following the worker through life. This is a strategy game, but there are setbacks and rewards that cannot be predicted. As time passes and your original character's children and their children and their children live and die, the age progresses and you become a senator, voting on measures that can make or break your society. A thinking person's game. I'm looking forward to the next installment. Rated 4 out of 5 by AndrewBarton from Interesting strategy - but only ONE step of 7 This game has some unique mechanisms. Much of the game is spent moving along the 'wheel', effectively a linear track, but every so often you get a story-based choice. This depends on your characters' 'personalities' as chosen as each comes of age but apparently not on the skills acquired during play. The game ends when you reach the end of the first grand step, and your family tree is saved for the sequel. If that means we're going to be expected to buy six more games to see the end of the story I'll be jumping off here. I think the amount of gameplay is reasonable for the price - it took me seven hours or so to reach the end of one family's story and there were parts of the game I hadn't explored. There is reasonable replay value. There is a wonderful tale within you. 7 Grand Steps builds a story of your ancestors and how you came to be.